The presence of the puny French banner somehow managed to make a football-field-sized American flag seem even more American. Sure, it’s not the size of the tribute that matters, and there’s no reason to doubt the sentiment behind the NFL’s gestures of goodwill to Parisians. But suffice it to say that in context, pro football’s declarations of love for France were rather less stirring than the scene at London’s Wembley Stadium Tuesday, where English fans sang “La Marsellaise” before a friendly match featuring ceux qui jouent au football avec leurs pieds. I think it’s important to do things like that. We’re a connected world. You know, six degrees of separation. I must admit that I was very disappointed with whoever the fan was who made a comment that I thought was really inappropriate during the moment of silence. It’s that kind of prejudicial ideology that I think puts us in the position that we’re in today as a world. Rodgers’ questioner was right. People do care what he thinks. And nobody in that room expected him to offer anything beyond generic expressions of sympathy. So it was a substantial risk when he used his platform to make a broader moral point—one that scorned a hometown fan, no less. 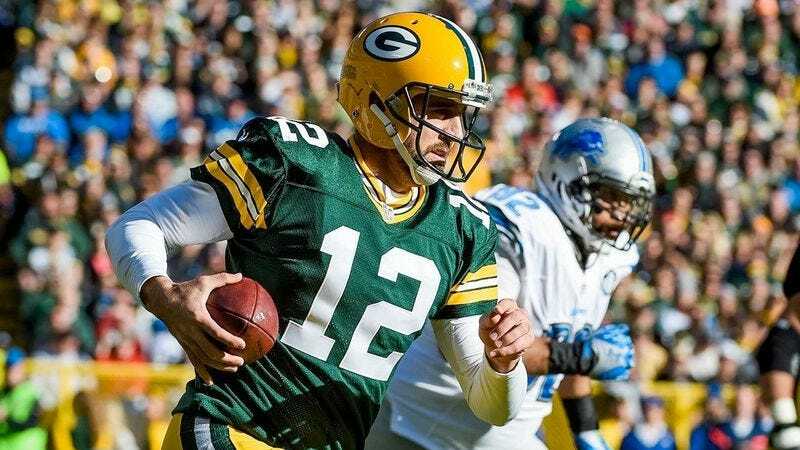 If Rodgers hadn’t said anything, the slur he heard in the crowd would have gone without much notice in the national media (although it was audible on Fox’s live broadcast). Instead of letting it pass, he took it as an opportunity to emphasize our connectedness and make an appeal to our collective dignity. As the week wore on, the political reaction to the attack conjured the demons of our national psyche. Thirty governors announced that they are against the resettlement of Syrian refugees in their states (even though the Paris attackers were neither refugees nor Syrian). It’s not evident that states have any authority to turn away federally sanctioned refugees, but that doesn’t matter, because the important thing was for these proud leaders to publicly oppose shelter for the weak and frightened. Meanwhile, Republican presidential candidate Marco Rubio—the latest great hope from the party’s so-called “establishment” wing—triggered Godwin’s Law by comparing peaceful Muslims to non-violent Nazis. Rubio’s decreasingly relevant rival Jeb Bush, for his part, suggested screening displaced war victims for Christ-worshipping bona fides. Donald Trump said some awful crap, too, but of course he did. Witnessing all that public cowardice over the past few days, my thoughts kept returning to the civic rectitude of Aaron Rodgers. Only naive fans expect star athletes to be role models, but that doesn’t make it foolhardy to hope. With 30 seconds of humanity, Rodgers exemplified American compassion in a way that put the braying xenophobes of our political class to shame (or should have, at least). One humble player said what a giant flag couldn’t. Vive la France. Rodgers for president. The Arizona Cardinals are boring. They just are. Every team has a personality. The Cowboys are flashy. The Bears are tough. The Browns are terrible. The Cardinals are boring, no matter how much success they achieve. Even though Arizona is 7-2 and has played only one truly bad game this year—Week 6 against the Steelers—you can tell that sports commentators on cable feel like they’re taking medicine when they talk about the team. (Local fans must be baffled by this indifference.) With a single play in Sunday’s comeback win over the Seahawks, though, backup quarterback Drew Stanton may have planted the seed of a new Cardinals identity: the team of exuberant dorks. Plus a karate kick as a coda. The fist pumps are what get me, though. Just when you think the dork dance is over, it reaches its marvelous pinnacle of dork. You can tell that Al Michaels loved it in the broadcast booth, too—his voice swelled with surprise and glee when Stanton pumped those elbows. Starting quarterback Carson Palmer, in the aftermath of the same play, unleashed his own (single-barreled) fist pumps to an unseen observer in the crowd, and then he thrusted his pelvis with comical swagger. It was also dorky, but the gestures lacked the giddy comic appeal of Stanton’s masterpiece—at the time. Palmer just hadn’t provided the punchline yet. In the days after the game, the national sports press whipped up speculation that Palmer might be fined for his rude gesture, because heavens to Betsy, the man moved his hips. So Palmer felt compelled to explain that his celebration was meant for friends in the stands whose names are—according to ESPN’s report—Pup, Phil, and Sugar Cane. In the space of only three friends, Palmer manages to run a gamut of nickname intensity that ranges all the way from “Sugar Cane” down to “Phil.” And the memory of Palmer’s herk-a-jerk crotch move is enhanced by knowing that it was performed for such an audience. Watch out for these dweeby dervishes as the season builds to the playoffs. The Cardinals may have found their identity. The Block & Tackle prediction: Arizona 34, Cincinnati 27. NFL fans! Jason Witten’s rippling thighs will look incredible in this shade of spandex! For the back end of the season’s Thursday Night Football schedule, games air only on NFL Network and not on CBS, so the league has to try harder to make people watch. Its main marketing strategy along these lines in 2015 is Color Rush, a series of games where both teams don bold, single-color uniforms. (The gimmick’s ignominious debut was noted in last week’s column.) Thursday night, the NFL unveiled the Color Rush uniforms for Thanksgiving’s Carolina-Dallas matchup—they’re the regular kit, pretty much, but with pants that match the jerseys. In other words, the league is inviting you to tune in to see a different color of trousers. The underlying message of this promotion is, “Thursday games stink—we just watch them for the clothes!” But yeah, football’s definitely a completely heterosexual sport. Somebody said it first, right? I’d like to find that guy. […] I think it flows pretty good. I think that’s why people keep saying it. It’s kind of fun to say. If I cut my hair, people would stop saying that, I would assume. That’s the only way I could get rid of it. But that would not be worth it. So, I won’t be doing that. I wonder who said it first. I’m really curious. And thus we enter the final act of Charlie Whitehurst’s career, the search for Nicknamer Zero. The Block & Tackle prediction: Atlanta 22, Indianapolis 15. There was once a time, long ago, when football viewers who watched Brian Orakpo celebrate a big play would have been left to assume that he said, perhaps, “Yeahhhhh!” Now, thanks to the leading technology scientists of NFL Labs, we can have vivid confirmation that in fact, he said, “Uwahhhh!” Thank you, televised sports industry, for never letting “good enough” be good enough. Here are Block & Tackle’s predictions for the rest of the Week 11 slate. All Block & Tackle predictions are guaranteed to be correct. If there is a discrepancy between a prediction and an actual football game, the football game is wrong. Tennessee Titans vs. Jacksonville Jaguars (last night, 8:25 p.m., NFL Network): Jacksonville 21, Tennessee Titans 17. Washington vs. Carolina Panthers (Sunday, 1 p.m., Fox): Washington 28, Carolina 25. St. Louis Rams vs. Baltimore Ravens (Sunday, 1 p.m., Fox): St. Louis 5, Baltimore 2. Dallas Cowboys vs. Miami Dolphins (Sunday, 1 p.m., Fox): Miami 20, Dallas 10. Tony Romo wrote thank-you cards to Brandon Weeden and Matt Cassel for taking such good care of the team while he was gone. Tampa Bay Buccaneers vs. Philadelphia Eagles (Sunday, 1 p.m., Fox): Philadelphia 33, Tampa Bay 20. Denver Broncos vs. Chicago Bears (Sunday, 1 p.m., CBS): Chicago 16, Denver 9. Although Denver starter Peyton Manning is out for this game, he will be throwing interceptions on the sideline to stay loose. Oakland Raiders vs. Detroit Lions (Sunday, 1 p.m., CBS): Detroit 24, Oakland 19. New York Jets vs. Houston Texans (Sunday, 1 p.m., CBS): New York 27, Houston 17. Kansas City Chiefs vs. San Diego Chargers (Sunday, 4:05 p.m., CBS): San Diego 19, Kansas City 16. The Kansas City Chiefs love it when head coach Andy Reid acts out the story of that time he ate a party sub all by himself. San Francisco 49ers vs. Seattle Seahawks (Sunday, 4:25 p.m., Fox): Seattle 28, San Francisco 21. Green Bay Packers vs. Minnesota Vikings (Sunday, 4:25 p.m., Fox): Minnesota 27, Green Bay 24. Minnesota plans to seed the crowd with a few drunken bigots in the hopes of making Aaron Rodgers say something inspirational again. Buffalo Bills vs. New England Patriots (Monday, 8:30 p.m., ESPN): New England 21, Buffalo 17.